Yesterday I also picked up two pieces that I had dropped of for framing a few weeks ago. Both pieces have been finished since the end of last year and I just got around to taking them. Bad Leslie. Oh Well, they are done now and I love how they turned out. The first is a seasonal themed round robin I participated in last year with Renee, Christine and Mylene. 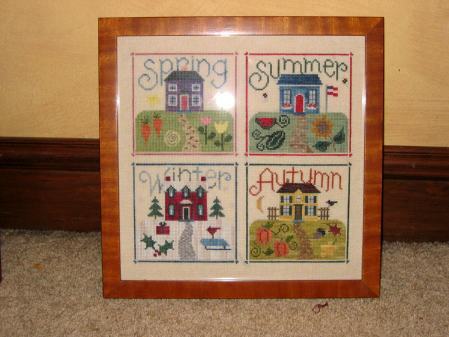 I stitched the summer house in the top right. The second is Mirabilia’s Woodland Fairy which I finished last November. I really love how she turned out. Her golden dress would look perfect on the walls of our family room, but unfortunatly there isn’t really a place where she could hang and not be obscured by something. I need to spend some time wandering around the place looking for the perfect spot. Well, off to a work dinner…hope everyone is having a fantastic weekend! Leslie, are you coming to CATS this year? These are gorgeous, especially the fairy. Well done on completing them and having them framed. 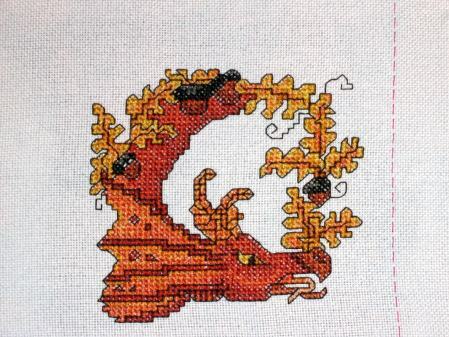 I bet you must feel pleased having completed all those fractional stitches in the dragon. Aww, I do like that dragon. I had that chartbook and I know they’re not exactly an easy stitch. Your framed pieces look gorgeous! The fairy would look great in the room you photographed her in as her dress matches the walls so well. Is that the family room? Shame there’s no room for her there. Love the framing, Woodland Fairy is gorgeous. The Autumn Dragon looks great too. Your dragon looks great. I love both of your framed pieces, they’re gorgeous… the frame you chose is perfect!! 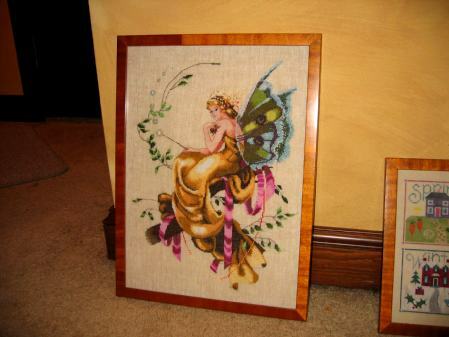 Hi Leslie, both the framed pieces have turned out great – hope you can find space for your fairy, lol. Lovely framing! Hope you find a nice spot for Woodland Fairy. Your framed pieces look amazing! Congrats! Love the dragon too, beautiful finish! Both of your framed pieces look wonderful! Congratulations on your dragon finish! And, your framings look wonderful! I see they are propped against the wall… my last group are still doing the same! I am surprised Mike is not pushing me harder to choose where to hang them! Yours are so beautiful! Oh, I love your framed pieces! And that RR dragon is just gorgeous now that he’s finished! The dragon is so cute! Your framed pieces are beautiful!! Your framed pieces look fantastic!! And I love the dragon. Everything is lovely – your woodland fairy is divine! They all look great, I love the frames you chose. Your framed pieces is gorgeous !! !